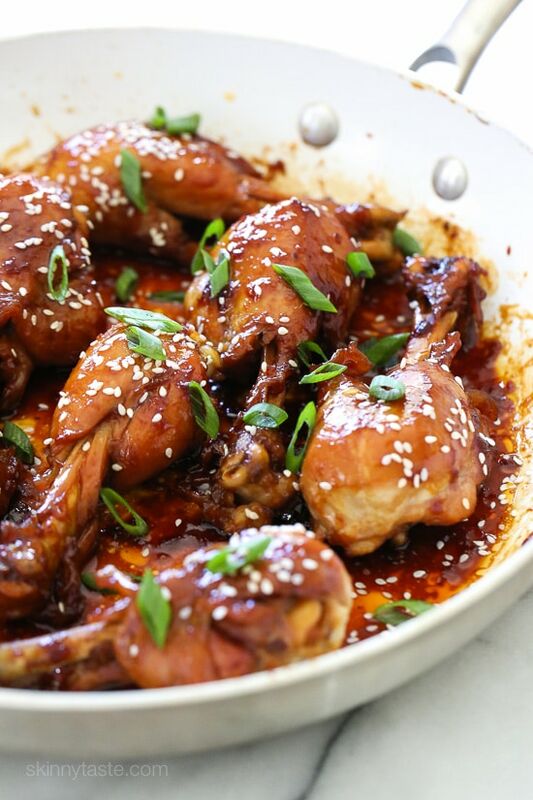 These skinless teriyaki chicken drumsticks sweet and sticky, and so delicious! Cooked in a skillet with honey, soy sauce, garlic and ginger until the chicken is tender and the sauce thickens. You won’t miss the skin! More chicken recipes I love are Filipino Adobo Chicken, Chicken Thighs with Shallots in Red Wine Vinegar, Chicken and Broccoli Stir Fry, and Turmeric Braised Chicken with Golden Beets and Leeks. I know this is a recipe you’ll be making over and over, it’s that good. You can serve it with brown rice, or for a low carb option try it with Cauliflower “Fried” Rice. Although they take a little time to simmer on the stove, they are super easy to make. I have made this with drumsticks, thighs and even chicken wings. I have even made it in my Instant Pot which cuts the cook time to about 20 minutes! I am providing directions for both skillet or Instant Pot, enjoy!! Combine soy sauce, rice wine, honey, garlic, ginger and sriracha in a skillet and cook medium-low, stirring for about 2 minutes. Add the chicken and cook 5 minutes, covered. Turn chicken, cover and cook 20 minutes over medium-low. Turn again, cover and cook 15 minutes, until the chicken is very tender. Remove the cover, if the sauce isn’t thick simmer uncovered until sauce thickens, about 2 minutes. Finish with scallions and sesame seeds. Use saute button, when hot add soy sauce, rice wine, honey, garlic, ginger and sriracha and cook 2 minutes, stirring. Add the chicken, cover and lock the lid. Cook on high pressure 15 to 20 minutes until the chicken is tender. When pressure releases, finish with scallions and sesame seeds. I am making these now. In the instapot. Since you didn’t say to crush the garlic I left them whiole (although I think they should’ve been crushed in retrospect – hoping it’s still okay). And I didn’t brown the chicken before adding it as you didn’t state that you should. Going to see how they come out because I’m so excited about these but nervous I didn’t do it right! I LOVE the instapot! And love your recipes. Just bought an IP. Have read warnings about how much liquid should be used in an IP. Is this enough liquid? First recipe in my Instant Pot. Delicious! Made this tonight, left the skin onand tripled the recipe in my IP. Manual 21 minutes 10 min QR. Fall off the bone tender. Super easy. Super yummy!!! This did not work AT. ALL. I followed the recipe exactly but ended up with an IP full of boiled chicken and liquid that is basically useless. Recipe looks great. I am also an IP newbie. Dint we hafta add at least 1/2 or 1 cup water or broth to the instant pot to make it come to pressure? I’ve been a long time follower of your site (it’s practically the only one I consistently use) but this is my first time leaving a comment. I should have left a message sooner! ? All of your recipes are wonderful. I can pick any recipe from your site and I know it will turn out delicious. And for someone like me who is a recipe follower (I can’t just throw stuff together and create something edible! ), this is a huge load off my shoulders. I hate meal planning and cooking but you have made it so much easier. Thank you! This dish is one of the best tasting things I have ever made, and I am a harsh critic of my own cooking. I left out the rice wine because I didn’t have any. And after releasing the pressure from the IP I switched to sauté mode, flipped the drumsticks over and let it cook a bit in the sauce (read this in another comment-thank you!) It was so tender and flavorful, and so easy! Thank you for all of the work that goes into developing your recipes! I’ve been making this recipe for years now and I thought I’ll leave a comment because this is a plate that my whole family enjoys. I just served this and even my 4 year old ate it (I add the sriracha at the end after removing a couple of pieces of chicken for her, mix it well and let it cook for an extra couple minutes). 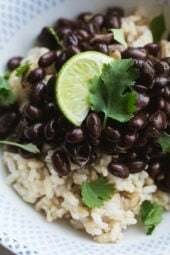 It’s very easy to put together and it has such a nice mix of flavors that work so well together and make a great weekday meal. I serve it with steamed rice and broccoli or other vegetable and I’ve also used boneless skinless thighs because that’s what I usually have handy. Thanks Gina! This is a GREAT idea! I’ve been trying to figure out how to leave some less spicy for my kids while enjoying the sriracha flavor myself. Thanks for the idea! My husband loves these. I’ve had issues in the skillet – burned these to a crisp – but the instant pot has been a winner! Thank you! I just bought an 8 quart Instant Pot. Will this recipe have enough liquid for the larger pot? I believe the 8 quart requires more liquid than the 6 quart. This was delicious – used the instant pot recipe guide and it was a breeze! 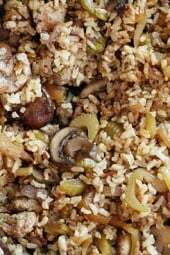 I loved this recipe and I used the leftover sauce for some fried rice. Thanks! This recipe was a lifesaver tonight! I made this in the skillet using 6 medium sized chicken thighs cooked for the same duration. I didn’t have the rice vinegar, fresh ginger or scallions. I did use ground ginger and added 1/2 a chopped onion and 1/2 a green bell pepper after it was finished. Added a little extra sricha and honey (I cheated lol). I served it over brown rice. The chicken was super tender and the sauce was awesome! What’s the the difference between rice wine and rice vinager? I cant find rice wine at the store but have rice vinager. Another fantastic Skinnytaste recipe!! We have this regularly in our house. I hate to skin chicken, so we use the boneless and skinless thighs and it turns out great. This is a never fail recipe-love it! Smells delicious but did anyone else get the BURN message on their Instant Pot? I just added 1/4 cup of water and set it again. Fingers crossed! I am making this right now with chicken breast, with ribs, skin removed. I added a couple TBL orange marmalde to hopefully thicken the sauce in the Instant Pot. Can’t wait for it to be done. Gina,I just got my very first Instant Pot yesterday & this was my first meal in it. What a HIT! Even the Picky Eater Child gave it a thumbs up!I’ve been making your recipes for about a year now & my husband is especially glad I found you. Thanks for all the yumminess & keep it coming!! Just add a little arrowroot flour to the sauce after taking out the chicken and turn on sauté for few minutes. Sauce will thicken up nicely. I got an Instant Pot last night and this is my first ever meal in it. The chicken was tender and juicy, but the pot was filled with water when it was done so the flavors from the sauce were really diluted. I could barely taste the soy/honey/ginger, and the chicken definitely wasn’t sticky. Can anyone troubleshoot for me? It seems a lot of people mentioned that they turned the IP back onto saute after they took out the chicken, to reduce the sauce to create more of a glaze. I’m going to try doing that when I make these. I find, most sauces come out of the IP or crockpot pretty watery.. it’s the method of cooking. I’m sure making this in a skillet would have different results- but of course, it would also take a little longer and require more attention. Do you press meat first then high pressure? Thank you for all of the delicious recipes! This is a favorite recipe of mine and have made it many times on the stove top. I just purchased and Instant Pot and was so excited to see instructions for this very recipe! However, the chicken wasn’t as coated and the sauce wasn’t as thick when I used the Instant Pot, so kind of a let down 🙁 Any tips on how I can make the Instant Pot recipe seem more like the stove top one would be super appreciated! You can but it will taste a little different. Thanks for sharing – my family loves this recipe! Do you think I could mix up the marinade and freeze it with the chicken (before cooking it) to make it a freezer meal? I’m going to try boneless skinless thighs sonthere is more meat!! I made this with drumsticks and my husband and I LOVED it. So tasty!!! I had a hard time removing the skin from the drumsticks. What is the easiest way to do this? Wow!!! I made this dish tonight and these were AMAZING!!!! Made it in the skillet and it was so fall off the bone good. I served it with brown rice and broccoli. I loved this!!! The sauce was wonderful too. Thanks Gina! I just realized that I can find your recipes already entered into MFP!!!!! This will save my so much time! Thanks!! I was wondering if you can make this with unthawed, frozen legs in the instant pot. Hi Just did your Teriyaki Chicken in my IPot. It was Awesome – used white wine instead of Rice Wine. Was Deliscious!! If using chicken breasts in the IP, how long would you cook them? My husband and I made this last night and loved it. I just entered it into the Recipe Creator on WW and for some reason I’m getting 8 SP per serving. I’ve done this with other Skinny Taste recipes and never had a discrepency. Has anyone else entered these into the tracker and gotten a different SP number as well? I am curious, what kind of rice wine did you have in mind? I have mirin, sake and shaoxing. All rice wine, all worlds apart. My husband is not really a chicken eater but he loved these drumsticks! Great flavor and so simply in the Instant Pot. Just swap them out, it should work. I think it would be more glazed in the skillet. I know you can cook meat from frozen instead of thawed in the instant pot, do you know how to adjust your recipe for frozen meat? Also would powdered ginger work? I’m out of fresh but want to try this tonight! I actually never cook from frozen, and yes powdered should work. FHello! I got an Instant pot for Christmas and I find the instructions to be a pain. To pressure cook you just have to press pressure cook and timer? Or adjust , or poultry and then pressure cook? Too many options, I liked my old pressure cooker, but I must learn how to use this one. P.S. I love all your Latin American dishes, like Pollo Guisado y sancocho. I makes me feel like I am cooking back home. NOw if I can only get my gringitos to love it all. Yes, its real easy, read the manual for the basic directions. I made this last night and loved it … but… I had 12 drumsticks so I upped the recipe. And I didn’t have rice wine, neither did the store so I used SavBlanc… online somewhere it said that was a decent sub. But my sauce never thickened… like at all, pure liquid. It still tasted AWESOME!! But did the reg wine mess it up, or something else? Anyone else experience this? I really wanted it to look like the pictures! Thanks!! I would like to make these, but am concerned about the low volume of liquid for Instant Pot. Has anyone had a problem not using the ‘required’ 1 cup of liquid? Made this tonight and it was delicious! I set mine for 17 min. Wasn’t sure about natural release so let it go for 5 min and then turned the valve. Was so good. My husband was skeptical about legs, normally only likes chicken breasts but loved them. Looking to make this in the IP, does it matter if the chicken is frozen or defrosted first? I’ve never used frozen chicken. I’ve made this twice in IP and my sauce came out watery. What am I doing wrong? Made this tonight… It was excellent!! Hubby requested 3 drumsticks for his portion next time. I didn’t have rice wine but used Angry Orchard hard cider :). As a side dish I cut up fresh broccoli and white mushrooms and stir fried them in the sauce left in the pan. Spooned that over 1/2 c brown rice. Delicious! I can’t wait to make this but want to use breasts – preferably boneless and skinless but I would use the breasts on the bone (skin removed) if you think it would vs better. How would you adjust? Thanks!! I haven’t tried it, but it should work fine. Let me know how it comes out! I loveeeeed it. I made it tonight for dinner. It was so simple, yet packed with so much flavor. Keep giving us such dishes. could I use ground ginger in place of grated ginger? Gina, I love hour recipes, I am a big fan of your blog and cookbooks, just press ordered the new book. Your weekly meal plans including shopping list is Amazon, exactly what I needed can’t wait to start. Big complement to you, my whole family and friends love what I bring to the table. Hi! What’s the difference if I use thighs in terms of calories, cooking time and serving amount? Thanks! I love all the recipes for the instant pot. I just got one and LOVE it! Please keep more of these type of recipes coming. Hi, I love my IP but have fear issues as it relates to having enough liquid in there to cook – it looks like only 1/4 cup liquid in the recipe rather than the IP suggested 1 cup. Is is the liquid content enough? Hi Gina, I made this tonight and it was delicious. One small request: in the nutritional info the sat fat grams are not listed; i.e. It just says saturated fat g, This has happened with quite a few of the recipes lately. I’m sure it’s just a program glitch. Thanks much! Hi Gina, I made this tonight and it was delicious. One small request: in the nutritional info the sat fat grams are not listed; i.e. It gust sats saturated fat g, This has happened with quite a few of the recipes lately. I’m sure it’s just a program glitch. Thanks much! In had to add more liquid, mine would not pressurize without 1/4th cup. I make a lot of chicken. This was absolutely delicious! I marinated the chicken in the sauce for a few hours. I then took it out and throughly cooked the sauce and followed the directions. It was tender and juicy and everyone in my family loved it. Was the sauce supposed to be thick after cooking in the InstantPot? I followed the recipe, and when I took off the lid, I had nicely cooked chicken legs and then a watery sauce. I had to put the put on a burner and heat it for a long time to get the sauce to a nice consistency. What gives? I was expecting the results to be very similar to a glaze but it was more like boiled chicken. I think next time i will try using a skillet. I turned my Instant Pot back on Sauté after and reduced the sauce down to a glaze. Done with a whole pack of chicken wings from Aldi! Done in the slow cooker, delish! What changes did you make to the directions to cook in slow cooker? I’d like to try this too. It won’t thicken as a glaze in the slow cooker, but it would still taste good. I would cook low 6 hours. I wonder if you could boil down or simmer some of the sauce from the crockpot before serving? It might thicken it up. I’m considering making this in the slow cooker and I’m wondering if you had an issue with the sauce not thickening enough. Was it an issue? Thanks! Sinead how long did you cook them in the slow cooker ? Did you do this in the instant pot? Wondering if I cook the them for same amount of time?? Just made this today in my Power Cooker Express (don’t have the insta pot 🙁 But the sauce didn’t thicken. Any suggestions. I’m going to serve it with your Asian Edamame Fried Rice. Thanks for putting up the recipe, I’m always looking for points-friendly pressure cooker recipes. When I made this in my Wok, I followed the recipe exactly but the sauce wouldn’t thicken until I turned the heat up to high and cooked uncovered for 7-10 mins. Simmering, as the directions said to do, would’ve taken forever! So maybe try increasing the heat? Really depends on the heat of your stove, use your judgement. Is rice wine the same as Mirin? Mirin is what I used. Hi Gina! Which setting did you select on the Instant Pot after browning the drumsticks? Poultry? Or manual and then just set the timer? Thanks! I made them and they were wonderful. My mom said she could smell them cooking from outside the house. The only issue I have is your serving size. Two drumettes is not a meal even with veggies. BTW I used apple juice for the rice wine and reduced the soy sauce to 2 tablespoons. I also minced onions (or was it shallots) to the ginger and garlic mix. I might have increased the honey a bit too but essentially it was your recipe. YUMMY. Glad you enjoyed them. How many drumsticks do you usually eat? I dont eat wings normally but had a bite or 2 before I served them. My father ate the equivalent of 3-4 wings so 6-8 pieces. My mom would have 2, maybe three so 4-6 pieces . She is a small eater. My brother would have 4-5 wings. Everyone is different. No way would a person, diet or not, eat just one wing (2 drumettes or drumette and wingette as a meal) and be able to call it a meal. Agree, if you use drumettes you would have to eat more since they are smaller than drumsticks. Do you mince the garlic or leave whole? Thanks-that’s what I wound up doing. Absolutely delicious. First meal I have made in months that my 4 year old devoured, and has requested I make again! Kikkoman Aji-Mirin. In the Asian aisle of your supermarket. I ended up using sherry in place of the rice wine. The drumsticks were phenomenal…..will most definitely make these again! I use mirin and it turns out great! Hi Gina and all! I made these on Sunday and seems to be only moi to mention that albeit, VERY good, however the saltiness from the low sodium Soy Sauce I used was ‘out of site’ salty. I actually thought there was a typo. Do not think this would matter, but I used skinless, boneless thighs? I will definitely make these again, however, 2 tbsp will be more than ample, using. 1/4 cup is 4 Tbsp. Making them almost enidible………..but knowing how the flavors melded, there definitely will be a next time very soon using 2 Tbsp. I am very SURPRISED nobody mentioned. Otherwise another winner from Gina! Thank you! It was great!!! And it went well with my 6yo!!! He reached into the fridge for a second leg later!!!! I didn’t find rice wine…but saw that I could sub it with Apple Juice…which I had and I never got the sauce to quite thicken up…but it was yet another excellent point friendly recipe that my son loved as well!!!! Wow! Just made this for dinner and it was fabulous! My college age son ate 5 chicken legs and said the recipe was definitely a keeper!!! Will definitely make this again! Not sure? If you print as a pdf are you seeing the same issue? I made these for dinner tonight and OH MY GOODNESS! They are delicious. I served them with brown rice, cantaloupe and sweet corn. Satisfying and yummy! I’ll be making this dish again! Thank you! 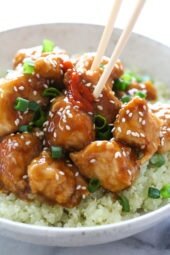 I am new to this Instant Pot cooking and would need to double this recipe to feed my family. Does the cooking time change when you double the meat? Thanks for any help!! It’s shouldn’t but I don’t know how many drumsticks you can get in there and if the sauce will coat it well? I recently purchased a Phillips All-In-One-Cooker, so looking for any opportunity to use it. Love the fact you have also included instant pot instructions. Down on the menu for this weekend…can’t wait! I like the instant pot directions too! Thanks! I made them yesterday (skinned legs) in my Instant Pot – I had more like a dozen legs, so I upped the sauce about 25% and added about 1/3 cup water to make sure I got up to pressure. After 20 minutes and natural release the legs were fall-apart tender. Took them out and onto a foil-lined tray, then boiled the sauce down to a thicken consistency. I spooned sauce over the chicken and broiled until lightly browned and more caramelized. Served over left over rice sautéed with tatsoi/yellow pepper/onion mixture and a little sesame oil. My husband thought they were wonderful and he normally hates dark meat chicken – removing the skin made all the difference. I have a lot left over, so now I have to think of ways to use it up – any suggestions? Can this be adapted for crockpot? If so, how long should the cook time be? Thanks in advance! Keep the Instant Pot recipes coming. On your recommendation I purchased one on Amazon Prime day. I’m still waiting for them to ship it, but am anxious to try your recipes once it arrives. Thanks! Making this for dinner tonight and I can’t wait to hear everyone say how delicious it is, because I know they will! Thank you for more Instant Pot recipes! Thanks for the great recipe. Using the Instant Pot, I tossed the chicken in the heated sauce for two minutes then cooked for 16 minutes on high which made amazingly fall-off-the-bone tender meat…delicious! I did not have rice wine so replaced it with a mix of water and rice wine vinegar, which seemed to work all right. Do you think it would be possible to use boneless skinless chicken breast? If so, what would be the cooking time? Thank you! Do you just put everything in the IP and hit go for 20 min with natural release? Just bought IP and have never used one before? That’s what I’d like to know too! I would like to know the points with a bone in chicken breast, skin removed. Same, has anyone tried this with chicken breast? Does it alter the cooking time if you sub that out? 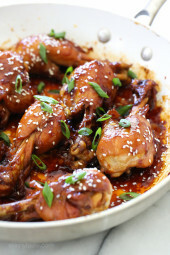 Can you make the teriyaki honey drumsticks in the slow cooker? I did…turned out great. I just cooled it on low. How long did you keep it on low? I was looking to cook them the same way. Good morning. I’m a newbie IP owner. What kind of release? Natural, quick (I’m so new I don’t even know what those terms mean yet ? Usually unless stated it is natural release. Letting the pressure release naturally makes for more tender meat. Is there anything to substitute for rice wine? I have everything else in my pantry. I dint have rice wine or honey. I substituted honey for some sugar and skipped the rice wine. It turned out well. My roommate and I loved it. I used white wine vinegar and it was delicious.